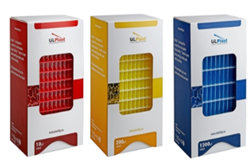 Ulplast 사의 다양한 종류의 OmniTip Pipette Tip입니다. Reload Type tip은 rack에 96 개의 팁을 한번에 옮겨 인적, 시간적 소모를 최소화 할 수 있습니다. compatible with most single and multi-channel pipettes available on our market. precision and repeatability of measurements done by means of our tips.